Another little interesting chapter in our misunderstanding of the setting of the Christmas story is found in our perception of the wise men. This story, only found in the book of Matthew, is one that is seemingly familiar to all Christians. However, when you really look into the story culturally and historically, it is amazing to see how may misconceptions surround this event. Let’s do a careful reading and look at several things we thought we knew about the wise men and discover what the facts really are. There were three wise men: No number is mentioned in the account in Matthew. The fact that three different types of gifts were presented (gold, frankincense, and myrrh) has given rise to the idea that there must have been three men that carried them. There actually could have been any number of men. 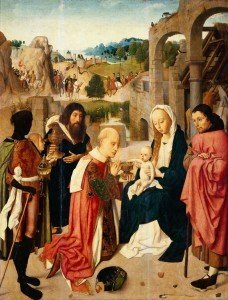 They were kings: The bible account does not call them kings, but calls them magi. The word magi, sometimes translated wise men, is the root word from which we get our word “magic”. They were learned men who were knowledgeable about many things including the stars. They were often placed in positions in the king’s court and were consulted for interpretation and guidance. For example, Nebuchadnezzar, in the Book of Daniel had a stable of court magi whom he consulted on various items including interpreting his dreams. When Daniel was able to interpret the King’s dream and the magi couldn’t, Daniel was promoted to head magi. They were from the Orient (the Far East): The Bible says “from the east”. The east in Bible times was the desert land east of the Jordan and more specifically present day Saudi Arabia. This is where frankincense and myrrh were grown and produced. Another interesting thing to note is that the wise men said they saw the star “in the east” and they followed it. If they were from the east and the star was in the east and they followed it, they would have ended up in a far different place than Israel! This problem stems from the translation, “in the east”. That same phrase can also be translated, ”at its rising”. The magi saw the star when it appeared in the sky in such a position that made them think that it said to them that the savior of the Israelites had been born and they actually followed it to the west to get to Jerusalem. One of them was a black man: Highly unlikely considering where they came from. One thing most scholars now agree upon was that at least one of them was probably a woman. The reason they have come to that conclusion is that the wise men stopped and asked for directions (just kidding)! They visited the baby Jesus at the manger scene: Nativity scenes all have the wise men with their camels standing around the manger. The wise men aren’t even mentioned in Luke’s account of the nativity scene. In Matthew 2:1 it says, “ Now after Jesus was born in Bethlehem, wise men came from the east to Jerusalem”. Then in Matthew 2:11 it says, “when they came into the house”, this was not the same Greek word that they used to describe the place where Jesus was born. Also, it says that they saw the “child” and this is not the word that Luke uses to describe the baby Jesus. The word that is translated child in Matthew is a young boy and not the word for baby. Jesus could have been as much as two years old when the magi finally saw him because that was the age that Herod thought the baby might be after he talked to the magi and asked them how long it had been since they saw the star. Whatever age Jesus was when the wise men saw Him, He was not a baby in a manger, but a young child living in Bethlehem with His parents before they fled into Egypt and eventually settled in Nazareth. All of these differences surrounding the Nativity Story were very revealing to me because I realized that I had let someone else explain God’s word to me. A careful study exposed some interesting facts that were different than I had been taught. None of these facts really change the meaning of the story, but it definitely helps give you a better mental picture of the story as it probably played out. Next Christmas season try to remember some of these new mental pictures as you celebrate the birth of our Savior. In our Christmas manger scenes there are always several shepherds that are placed around the display. These shepherds are always 35-40 year old, bearded men. In reality in the Middle East, almost all the shepherding is done by very young children, most of them girls. In the Middle Eastern culture, the men do very little of the menial work. You might find them sitting under a tree watching their children handle the livestock, but they rarely do the labor themselves. Even today in Israel, you almost never see older men actually tending the sheep. Instead, younger people are given the job of walking with and taking care of the animals. A great Old Testament example of this is when Samuel came to Jesse’s house to decide who would be the king to succeed Saul. He looked at all the older sons and then asked if there were any more. David, the youngest of the brothers, was out tending the sheep. Most scholars think he was around ten years old when Samuel came to anoint him. It is highly unlikely that the shepherds that were visited by the angels on the night that Jesus was born were older men. They were most likely young boys and/or girls that got to see that miraculous sight. Also, the fact that the shepherds were, “in the fields” is very significant. For most of the year the shepherds kept their sheep in the wilderness or desert areas of Israel. They moved the sheep constantly, looking for enough grass to keep them going. The desert was where the shepherd stayed with his sheep, even from the earliest times in Israel. They only came to and were allowed into the fields at one certain time of year. The word used here for field denotes a specific type of cultivated land, not just land in general. The fields in Israel are only found in a narrow mountainous strip in the center of the country, around Jerusalem and Bethlehem. These fields were where the farmers raised their barley, wheat and other grains. The wheat was typically harvested in late June and July, much the same as in the United States. After the wheat had been completely harvested, there was a two week period where the poor people could come in and glean the fields. God instructed the Jewish people not to cut the corners of their fields, but to leave some for the poor, the alien and the widows (see Leviticus 19:9-10, Leviticus 23:22, and the story of Ruth). 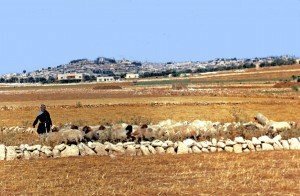 Only after the last day allowed for gleaning would the shepherds be allowed into the fields with their sheep to eat the stubble and whatever else remained. The time of year that they would have been allowed into the fields would have been approximately the first to the middle of August. They would have stayed in the fields eating and fertilizing until late September or mid October – departing in time for the owners to prepare their fields for next year’s crop. The early rains in Israel usually start to fall in late October and November and the farmer would have to have his soil prepared and ready by then. If the shepherds were in the fields when Jesus was born, what does that say about the date of December 25 as his birthday? There is a lot more to this that we don’t have time in this limited space to cover, but it is a fascinating study! At the least it certainly begs for the possibility of a different date than what we traditionally celebrate as the birth of the Christ child. Now that we have covered the trip by Joseph and Mary to Bethlehem, the manger scene and the shepherds, it is now time to take a look at the wise men that came, following a star to this now famous little town in Israel. The problem with this mental picture is that the English translation of the phrase “no room in the inn”, has taken on the meaning that there was an inn that had a number of rooms that were already occupied. The Greek words that are used here do not refer to rooms in an inn, but refers to space (topos) in an area, as in “there is no more space on my counter for another appliance”. Instead of no room, there was no space in the “katalyma” (Strong’s 2646) or the word translated in this verse as “inn”. However, this is not the ordinary word used for a commercial inn. In the parable of the Good Samaritan, also occurring in Luke (Luke 10:25-37), the Samaritan takes the wounded man to an inn. The Greek word that Luke uses here is, “pandocheion” (Strong’s 3829). The first part of this word means, “all” and the second part means, “receive”. The pandocheion is the place that receives all and is a commercial inn or motel. So, if Luke wanted his reader to think that Joseph and Mary were turned away from an inn, why didn’t he use this same word that he used later on in his Gospel? What does “katalyma” mean? It simply means, “a place to stay” and can refer to many types of shelters. The three that are options for this story are inn, house, or guest room. Luke’s choice is guest room because he uses this same word, ”katalyma” on another occasion in Luke Chapter 22 when he describes the story of the upper room. The room the disciples were to eat the Passover meal (Luke uses “katalyma”) was a guest room in a private home. This makes perfect sense when you put it back into the birth story. Luke is telling his readers that Jesus was placed in a manger because in that home the guest room was already full. This leads to the next question: what and where was the manger? Westerners always think of a manger as a stable or barn that is separate from the sleeping quarters of the home. In reality, at this time in the Middle East, homes were simple two room structures containing a family room and an attached guest room. Some dwellings were simply caves that had been walled in and expanded into two-room homes. At night, some of the family’s animals were taken into the family room part of the house. The place where the animals stayed was in a step-down area close to the main entrance. 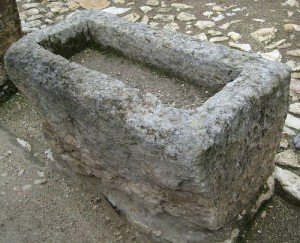 A manger was made of stone (not wood) and was either carved into the floor of the house or brought into the house where the animals were kept and was used for their feed and water (see picture). A manger in the Middle East is a feed and water trough made of stone. To summarize, what Luke tells us about the birth of Jesus is that Joseph and Mary traveled to Bethlehem, where they were received into an ordinary peasant home and were graciously allowed to stay in the part of the house where the host family stayed with their animals. Their guest room was already occupied. Fitting with early Christian tradition, the home could have even been an expanded cave. When Mary gave birth, she wrapped her newborn son and put him in a stone manger and covered him with a blanket. It would have been a humble, yet loving environment for the birth of the baby Jesus. Mary and Joseph with baby Jesus and the donkey --David Jones, C.H. 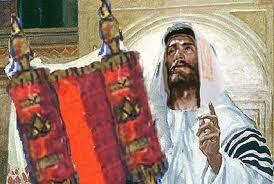 The events that comprise the well-loved Christmas Story are known to almost everyone and especially all Christians. Joseph and Mary’s journey to Bethlehem, no room in the inn, the baby born in a stable and the manger scene; shepherds in the field, three wise men bearing gifts and the star that they saw are all scenes that immediately bring up pictures in our minds. They are very familiar to us and are deeply embedded in our Christian consciousness. However, is it possible that over the centuries, special ways of seeing the story have developed that are not necessarily part of the Text? The more familiar a passage becomes and the more people that are telling the story, the bigger the chance that some interpretive glitches could occur. Is there a difference between what the Text says and our traditional understanding of our beloved Christmas Story? Let’s take a look first at Joseph and Mary as they return to Bethlehem about the time of Jesus birth. In the first three verses of Luke 2, it says that the Romans ordered a census to be taken and everyone had to return to their own town to register for the count. For Joseph, the town of his origin would have been Bethlehem. The telling of the Christmas Story over the years has led us to believe that Joseph and Mary were going to a town where they didn’t really know anyone and weren’t really treated all that hospitably. Nothing would have been farther from the truth. In the Middle East, historical memories are long and very important. 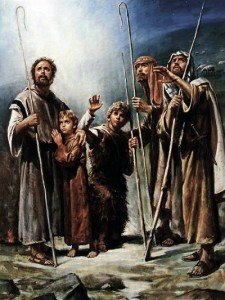 Joseph was the son of Heli, son of Matthat, the son of Levi (Luke 3:23-24) and because of that lineage almost every home in town would have welcomed him. Joseph was from the royal lineage of the family of King David. The family of King David was so famous in Bethlehem that the village itself was called, “City of David” (see Luke 2:4). Being from that family, Joseph would have been welcome anywhere. The would have been thought of as “royals” in Bethlehem and important people. Mary was also of the House of David and would have also been required to register. In addition, Mary had relatives living nearby. Elizabeth and Zechariah also lived in the hill country of Judea around Bethlehem. Another interesting piece to our picture of the story is that Mary arrived riding on a donkey. The Text doesn’t say this and it is unlikely that Joseph and Mary owned a donkey. Donkeys and mules were the mount of kings and only the most wealthy owned them. We know later in Luke 2:24, when the parents took Jesus to the Temple to present Him to the Lord, they offered a sacrifice of two doves or pigeons, which was what the poorer people offered (read Leviticus 5:7) if they couldn’t offer a lamb. 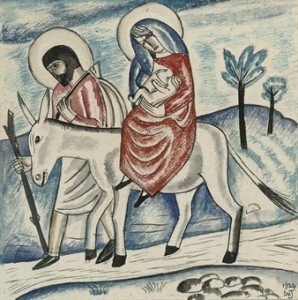 Common people walked everywhere and it is very likely that Joseph and Mary made the three day journey from Nazareth to Bethlehem on foot and not riding on a donkey. Next, lets take a look at Mary and the timing of Jesus’ birth. In every culture a woman about to give birth is given special attention by the community. Surely Bethlehem was no exception. They would have never have turned away a descendant of David in his home town while his wife was about to give birth. This would have brought much shame to the entire community. Also, our knowledge of the Christmas Story always assumes “the imminent birth”, or the fact that they had the baby as soon as they got to Bethlehem. They were willing to accept any shelter, even a stable, because of the almost immediate expected arrival of the Child. However, this is not what the Text says. Luke 2:6 says, “while they were there, the time came for the baby to be born.” This actually implies that they were in town some days before the baby was born. Joseph would have had adequate time to arrange a place for them to stay while they were in town. They would have been among people who knew them, respected them and were willing to assist them in the birth of their baby. To summarize, we have noted several differences from the traditional understanding of Joseph and Mary returning to Bethlehem for the birth of their baby found in Luke 2:1-6. Joseph and Mary were returning to their home village where they could have easily found shelter because they were well known. Also, because Joseph and Mary were descendants of King David, they would have been well received. Mary had relatives nearby and they could have even gone there if there wasn’t any space in Bethlehem. They would have made the three day journey on foot. The Text seems to imply that they were in Bethlehem for at least a few days before the baby was born. The community would have definitely wanted to help a young Jewish woman as she was about to give birth. These interesting illuminations about the events don’t cheapen the story, they really enrich it. But, it just shows how the story over the years took on different elements that are not found in the actual reading and understanding of the Text and the culture in which the story is set. Next, let’s look at the inn and the manger scene and see what we find any differences there. In our last lesson we looked at the two types of rabbis that were present during Jesus’ day; the regular Torah teachers and the special rabbis who had s’mekah. We discovered that Jesus was one of those special rabbis who had s’mekah and He spoke and operated with that authority. Rabbis with s’mekah could make their own interpretations of the Scriptures because they were anointed by God to do so. They would say, “You have heard it said, but I say to you” and then make a new and different interpretation of a passage in the text. This was a very special authority and was only conferred on a very few of the most brilliant rabbis of the day. These rabbis with s’mekah referred to their own unique collection of interpretations of Scripture as their “yoke”. They traveled around the countryside showing their students how to understand and obey their “yoke of Torah”. They established and fostered their reputation by attracting the best and brightest students to study under them and learn their “yoke”. These rabbis wanted the crowds to accept their teachings and to take on their way of doing things, and more or less saying, “Join my church”. There was competition among these top rabbis to see who had the most followers and the brightest students. Often, a rabbi would send one of his brightest students to test the yoke of another rabbi. He would ask a question like, “Suppose a woman marries seven successive brothers and all die, whose wife is she in heaven?” The rabbi would be expected to give a detailed answer incorporating his interpretation of the Text. This was done very respectfully, but they did this testing in order to sharpen their own yoke and expose what they thought were fallacies of the other rabbi’s position. For an example of this, let’s go to the town of Capernaum in the Galilee, where Jesus had His headquarters. Capernaum was the Harvard of Israel. The largest synagogue school ever found in Israel is located here. At least five rabbis with s’mekah were based here during Jesus’ day, and all of them had large followings of disciples. It was a very academic and thought challenging atmosphere, with all the rabbis testing and challenging each other. Jesus comes into town,with his disciples following Him, in Matthew 11:20-30. He says, ”Come to me all you who are weary and burdened and I will give you rest. Take my yoke upon you and learn from me, for I am gentle and humble in heart and you will find rest for your souls. For my yoke is easy and my burden is light.” In this context, Jesus was not talking to them as sinners and not discussing their burden of sin and the heavy load that they were carrying. He was talking to these very Torah-smart, disciplined, Jews who were trying to decide which rabbi’s yoke of Torah made the most sense. He was saying, “My yoke is the one that is easiest to understand and is the one that will meet your needs.” Jesus explained His yoke even further in Matthew 22:34-40 when the Pharisees and experts of the Law tried to test Jesus with the question of what He thought was the most important commandment. Jesus replied that the most important command was to “Love the Lord your God with all you heart, soul, and mind, and the second was to Love your neighbor as yourself”. Then He said if you keep these, then all the rest of the law is just commentary. There are many examples of this testing and questioning in the Gospels. If you continue re-reading the text with this understanding of their teaching methods, their yoke and competition among the top Rabbis, then the stories read a lot differently and have much more meaning. To conclude our study on the concept of “rabbi”, we have seen that Jesus was, in His human sense, a product of the system that was in place at the time. He was a brilliant teacher that amazed even the best trained and well-versed experts of the day. He was given His authority to speak and interpret the Text by God, Himself. Our rabbi, Jesus, gave us the correct “yoke” to follow and said that it was easy to understand and that it would give us rest for our souls. It is our task to learn that yoke and follow our rabbi with all our,” Heart, Soul and Mind”. Footnote: For a deeper understanding of Jesus statement about His yoke, please re-read the post entitled, “What Jesus Was Saying in Matthew 11:28-30”.